Welcome to this online directory of resources written by Wallace Thornton, Jr., a historian of the Christian tradition with special interest in the American Holiness Movement. 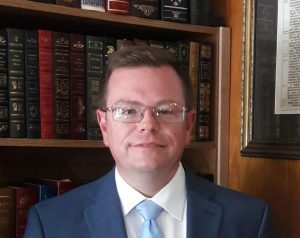 He earned the MA in Church History from Cincinnati Bible Seminary, holds membership in the Wesleyan Theological Society, is a charter member of the Wesleyan Historical Society, and serves on the advisory board of the journal World Christianity and the Fourfold Gospel. He has taught church history at three colleges and presented at numerous conferences. His publications include the books Radical Righteousness: Personal Ethics and the Development of the Holiness Movement (Schmul Publishing, 1998) and When the Fire Fell: Martin Wells Knapp’s Vision of Pentecost and the Beginnings of God’s Bible School (Emeth Press, 2014, also published in Korean by the Seoul Theological University Press, 2015), as well as contributions to the Wesleyan Theological Journal, the Historical Dictionary of the Holiness Movement (ed. William Kostlevy, 2nd ed. 2009), and Counterpoint: Dialogue with Drury on the Holiness Movement (ed. D. Curtis Hale, 2005). You may contact Mr. Thornton HERE. You may also wish to visit the pages for Wallace Thornton, Jr. at academia.edu and Amazon. The Conservative Holiness Movement: A Historical Appraisal (59 pages, paperback) presents a germinal essay on the formation of this religious tradition, bringing into focus the underlying rationale of the conservative position and evaluating its relationship to early Wesleyan-Holiness ethical emphases. An Afterword shares additional reflections refined in light of continued research into the movement’s history. This booklet may be purchased HERE. It is also available as an e-book here. Why Standards? Exploring the Connection Between Heart and Life (40 pages, paperback) continues this author’s interaction with the work of Dr. Keith Drury concerning the health of the Holiness Movement. It focuses on the relationship between the content and form of holiness as illustrated through a particular facet of the biblical analogy of the body for the Christ-filled life. This booklet may be purchased HERE. When the Fire Fell: Martin Wells Knapp’s Vision of Pentecost and the Beginnings of God’s Bible School in The Asbury Theological Seminary Series in World Christian Revitalization Movements in Pietist/Wesleyan Studies (341 pages, paperback) provides a multi-faceted historical study of the founder of God’s Bible School and the school’s formative years, underscoring theological and cultural developments. This book may be purchased HERE. Radical Righteousness: Personal Ethics and the Development of the Holiness Movement (343 pages, paperback) traces various emphases regarding behavioral standards throughout church history, particularly in the Wesleyan tradition, including stewardship, submission, and separation. It focuses on the mid-twentieth century development of what is commonly referred to as the Conservative Holiness Movement. This book may be purchased HERE. 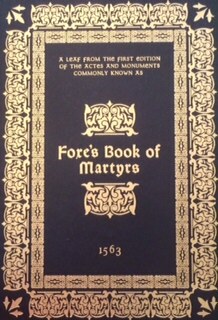 “John Foxe and His Monument: A Theological-Historical Perspective,” A Historical Essay in the book, A Leaf from the First Edition of the Actes and Monuments Commonly Known as Foxe’s Book of Martyrs 1563 (Birmingham, AL: Aldersgate Heritage Press, 2013), pp. 9-71. Check for availability here. Copyright © 2017 by Wallace Thornton, Jr. All Rights Reserved.